Research Topics: Characterization of biomaterials, Biomedical diagnostics and therapy, aquaphotomics. 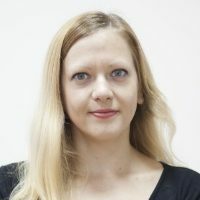 Jelena Munćan currently works as an Assistant Professor at the Biomedical Engineering Department, Faculty of Mechanical Engineering, University of Belgrade in Serbia. She is a mechanical engineer with a PhD degree in Biomedical engineering. Since 2011 she was introduced to the field of aquaphotomics, which considerably shaped all her subsequent research. The framework of aquaphotomics inspired her to search for better understanding of water phenomena and how it can be implemented for the purposes of biomedical diagnostics and therapy, as well as better understanding of the role of water in biological organisms. With time, the aquaphotomics since 2011 have significantly altered the course of research at the Biomedical Engineering Department in Serbia, leading to improvement in education and the choice of offered courses such as Statistics and Data mining, Spectroscopy methods and techniques as well as a new PhD course entirely devoted to aquaphotomics. In all these research projects aquaphotomics plays key role. Our research efforts are directed to better understanding the role water plays in biocompatibility and functions of materials on macro as well as nano level. In diagnostics, the quest for water biomarker in body fluids could lead to minimally invasive and non-invasive detection of cumulative changes of all biomolecules with role in disease pathogenesis which leave their imprint in water – imprint which can be detected as NIRS laboratory in Kobe, Japan and the founder of aquaphotomics, Professor Roumiana Tsenkova are consistently showing all these years on various biological systems. The goal of aquaphotomics group in Belgrade is to translate the research results of aquaphotomics to human medicine.